Start off your visit on the 20th (Sat): kick back and relax at Noosa Main Beach and then get great views at Laguna Lookout. 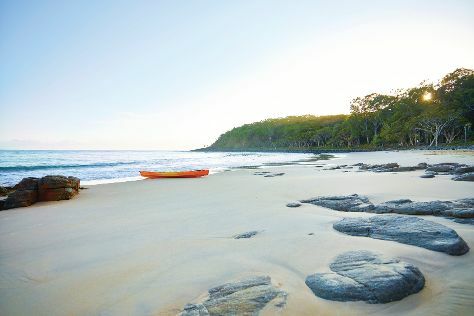 Quickly create a custom-made itinerary for Noosa using our trip planner. Townsville to Noosa is an approximately 16.5-hour train ride. You can also drive; or take a bus. Wrap up your sightseeing on the 21st (Sun) to allow time to drive to Gold Coast. On the 22nd (Mon), explore the wealth of natural beauty at Natural Bridge. To find more things to do, maps, reviews, and tourist information, read our Gold Coast trip itinerary maker website . Getting from Noosa to Gold Coast by car takes about 3 hours. Other options: take a bus; or take a train. In April, daytime highs in Gold Coast are 30°C, while nighttime lows are 19°C. Finish your sightseeing early on the 23rd (Tue) so you can take a bus to Byron Bay. Kick off your visit on the 23rd (Tue): enjoy the sand and surf at Wategos Beach, then take some stellar pictures from Pat Morton Lookout, and then head outdoors with Hastings Point Headland. Here are some ideas for day two: learn about all things military at Ballina Naval & Maritime Museum, enjoy the sand and surf at Lighthouse Beach, explore the activities along Lake Ainsworth, then look for all kinds of wild species at Broken Head Nature Reserve, and finally enjoy the sea views from Cape Byron Lighthouse. To see where to stay, maps, ratings, and more tourist information, use the Byron Bay attractions planner . Take a bus from Gold Coast to Byron Bay in an hour. Alternatively, you can drive. Traveling from Gold Coast in April, expect little chillier with lows of 16°C in Byron Bay. Wrap up your sightseeing on the 24th (Wed) to allow time to drive to Brisbane. Start off your visit on the 25th (Thu): kick back and relax at Moffat Beach, look for all kinds of wild species at Lone Pine Koala Sanctuary, then explore the world behind art at Queensland Art Gallery, and finally take in the spiritual surroundings of Old St Stephen's Catholic Church (Pugin Chapel). For more things to do, photos, reviews, and tourist information, read Brisbane trip itinerary planning website . Getting from Byron Bay to Brisbane by car takes about 2 hours. Other options: take a bus; or do a combination of bus and train. In April in Brisbane, expect temperatures between 30°C during the day and 19°C at night. Wrap up your sightseeing by early afternoon on the 26th (Fri) to allow enough time to travel back home.